Conveyance allowance of Rs 4,500 per month for medical officer and specialists was also approved. New Delhi: The Delhi Cabinet on Tuesday approved a proposal to enhance the monthly remuneration of contractually engaged medical officers and specialists under the Delhi State Health Mission (DSHM), officials said. There are around 2,600 contractual employees belonging to various fields such as medical, paramedical, managerial and support staff and all are contributing to the smooth functioning of the National Health Mission (NHM). “The cabinet approved the health department’s proposal for the enhancement of monthly remuneration of contractually engaged medical officers and specialists under the Delhi State Health Mission (DSHM),” the Delhi government said in a statement. These staffs were recruited according to the specific district/programme requirements and are working at the state and district-level administrative units and health facilities, it said. “Enhancement in incentive as a state share of 25 per cent (inclusive of 10 per cent already granted as state incentive) on gross remuneration as on April 1, 2017, was approved. Conveyance allowance of Rs 4,500 per month for medical officer and specialists was also approved, it said. “An institutional mechanism for a periodic review of the remuneration every three years shall be put in place whereby the remuneration can be examined for performance/continuation or discontinuation of enhancements if so required. The next enhancement will be considered in 2021,” the statement said. The cabinet also approved the health department’s proposal for the enhancement of consolidated monthly remuneration of contractual engagements under Delhi State Health Mission (DSHM). “Payment of incentive up to 10 per cent of consolidated remuneration (including the Centre government incentive for 2017-18) to paramedical contractual employees which have analogous nomenclature with the contractual engagements of Delhi government with a condition of maximum remuneration up to the remuneration of the corresponding contractual engagements employees under Delhi Government or similar positions under DSHM was approved,” it said. This is inclusive of the state incentive being given presently, the statement said. 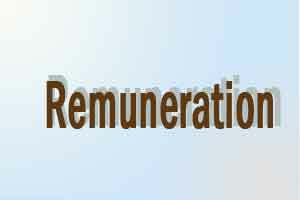 An institutional mechanism for a periodic review of the remuneration at every three years shall be put in place whereby the remuneration can be examined for performance/continuation or discontinuation of the enhancement if so required, it said.